Today is Ruby Tuesday and today were going to take a look at Hunters Point, Long Island City. Remember you can post anything RED - a lot of RED or a little bit of RED. 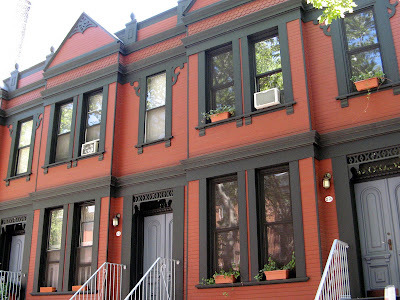 These red-brick townhouses are very special and marked as an historic landmark. I see some lovely (red) townhouses and a fun (red) cartoon of nuns. Is Ruby Tuesday coming? The napkin is funny, and I love how you color-coordinated it with the buildings! I'm sorry Mary but I can't find Mr Linky. Mine is up and running as well. I love the humour in your festive napkins and the red buildings are beautiful with their sturdy, strong, endurable appearance..
*LOL* I totally need these napkins! The red-brick townhouses are beautiful. I wouldn't say "No" to on of those. Ooops - I'm sorry... the first linky leads to my main blog. I guess it's a kind of "Manic Monday leftover", but Ruby Tuesday is posted on the photoblog. I can't delete the link myself... could you please help me, Mary? Thanks in advance and sorry for the mess. It's red as well!!! Isn't that funny? Beautiful Mary, oh and I love the napkins too! They are very unusual buildings! We have red brick houses but I've never seen them with black paintwork. It's very striking. Looks like a nice neighborhood. I like the container gardens. I am going to Manhattan next weekend (god willing) to shoot some pictures. Have a nice Tuesday. I have a couple of Daylilies and a red rose this week. Those homes are a beautiful red. Hello, I made my first Ruby Tuesday post. I hope you like it. By the way the houses look very good! Those red brick town houses look very inviting! I like the black accents. Happy Ruby Tuesday to you and all. It is not just the red in these townhouses, it is the detailing. Not ornate, but distinctive especially the window trim and the woodwork on the peaks on the facade. The style and elegance of a bygone era, for sure! I like the red buildings! Enjoyed the post very much! I will have a red post up tomorrow! That's a nice looking row of houses! great capture of row houses as well. Thanks for all you do to keep RT rolling Mary!! 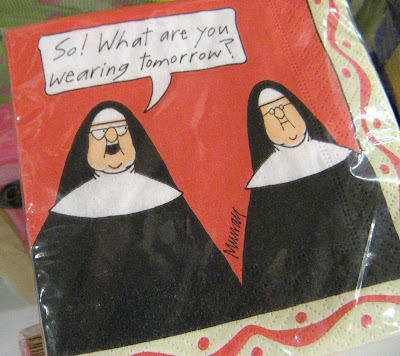 The nun napkin made me giggle. Thanks for the laugh! Happy ♦Ruby Tuesday♦ Mary! awesomely great photos! These are beautiful townhouses. I love the color! 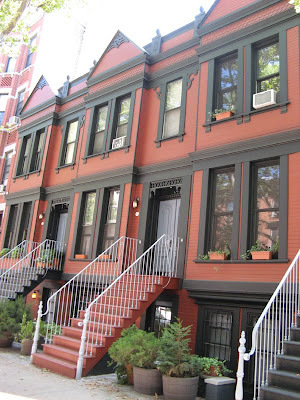 Love the brownstones with the black trim! And those napkins are too funny!! LOL! Too funny how you've found napkins to match the neighbourhood! I'm doing Ruby Tuesday for the very first time! I love your napkins the best. These are beautiful Mary! If I didn't live in my lovely rural country I would love to live in one of these. What smart looking townhouses -- so well kept. Happy Ruby Tuesday, Mary. I love those row houses, these are soooooo clean and pretty. Rules are to be broken, I hope I didn't be real bad today. What rule might I have broken? Sorry if it's too bad! I love the napkins. The townhouses are wonderful too. So neat and tidy and proper. The buildings very pretty, all dressed in red and black, as are your nun napkins, Mary! Window air conditioning? For premium priced real estate they're going to have to install Central Air Conditioning for my money! hahaha! Great photos from everyone! Very cool. Happy to participate. Cheers! 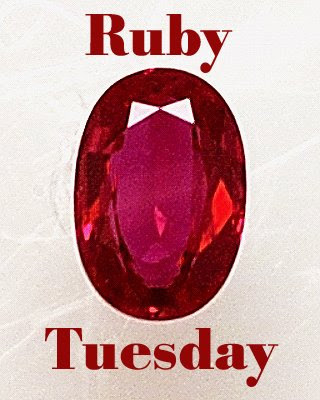 This is my first Ruby Tuesday also, enjoying blogging and connecting. Beautiful buildings - they remind me very much of townhouses in Amsterdam (the Netherlands) or old english ones. I just did my first Ruby Tuesday post over at Jantrails. EXCELLENT IDEA! Today started my official participation in this meme. Thanks for help us share our pictures. Nice houses, look very English, lol ! I am NOT wearing the same tomorrow !! These townhouses are really quite stately with the black trims! Impressive! What an incredibly beautiful building!!! Thanks so much for sharing it with us this week. Perfect choice for Ruby Tuesday. 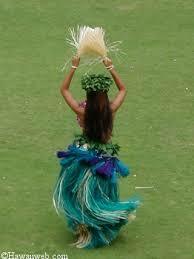 Please see my post here, and/or my whole blog I Was Born2Cree8. BTW... thanks so much for visiting my blog and leaving me your comment this evening (maybe last night to you now, haha). It was much appreciated. I love the red townhouses. so wonderful sight. Happy Tuesday! I did some research on the subject of my ruby pictures of this week and found out it was really something special!!! Oh Mary, this is really really special, I'm so excited! Love the decorative touches on the red-brick townhouses and the humor on the napkins. Very nice! I just love those red town houses - they're beautiful! Mary, I must apologize! I accidentally added Dr. John to your linky list... I had put his name on my dragon hunt and forgot to change it before I clicked for YOUR linky! He DOES have a lovely PINK dragon on his blog today though -- does THAT count??? LOL! I love your red brick buildings! Having watched what has become of some of the neighborhoods in DC, I know that these little beauties ARE prime!!! MY Ruby is up too! It's a PLAYFUL one! Love the napkin. That was hysterical. the napkin is a hoot! the townhouses are stunning, your photos really do them justice. Mary - your Ruby Tuesday meme certainly has taken off FAST! 61 comments! No way! Your rock! I'm up for today. I've already signed up on Linky...so I don't have to do that again. It would be sort of redundant. :) Don't want to get in trouble with the nuns, though. That red building it gorgeous. The black trim really makes it pop! that's a gorgeous building! 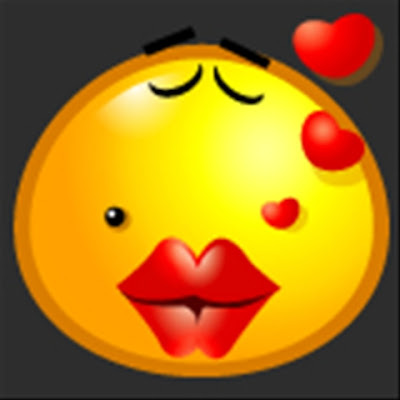 just love it. Lovely red architecture you got there! And the nuns are funny! :) Great pics for Ruby Tuesday! I finally joined the fun. Better late than never. Nice red townhouses! and the napkin is cute. I didn't know I needed to sign up each week. Sorry. 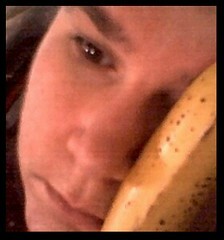 Life's Lessons, I couldn't get to your blog today (Tuesday) I'm going to try again later. 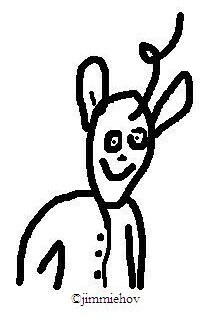 Thank you for visiting my blog and your kind comment! The napkins are a crack up!! I love the look of those red brick homes. I love the napkin! My Ruby Tuesday has a very special bit of red this week. I love the shade of red on those beautiful buildings. Thanks for sharing. I am going to get the blog and know that joke to post red, next week will be with you. I am already leading the seal. Hi- this is my first time playing along with Ruby Tuesday. I saw the one Quilly did and thought it looked like fun. Wow, what an amazing response to this week's Ruby Tuesday! Your participant list keeps on growing Mary, very impressive indeed. I didn't have a red photo to contribute this week but I'm thinking for another weeks RT! Loved your photos Mary, especially the funny napkin.